More and more I have been hearing people say that diet soda is bad for you; however, no one ever really gives a reason why diet soda is bad. Like most people, I assume that if something is classified as “diet”, it must be good, or at least better, for you. For that reason, when I drink soda, I always choose the diet version. Therefore, I decided to search for the answer to the question: “What ingredient in diet soda is ‘bad’ for you?”. I started my search by simply typing “why is diet soda bad for you” into Google. After scanning through several results that came up, I found an article from TIME.com entitled “Can Sugar Substitutes Make You Fat?”. This article briefly touches on a series of experiments conducted at Purdue University which found that rats whose diet contained saccharin, a zero calorie sweetener found in many diet soda brands, gained more weight than rats whose diet contained glucose, a natural, high calorie sweetener. The article then gives a brief explanation for why this happens using data from another study conducted at Purdue University. It explains that animals are conditioned to anticipate a lot of calories when consuming a sweetened food or drink. Therefore, when they do not receive the calories they anticipated, they will intake additional calories to compensate for the phantom calories. This article essentially answered the question I wanted answered; however, I wanted to know more details about the vaguely explained experiments that revealed this data. Furthermore, this article prompted me to ask a second question: “How does this ingredient cause weight gain?”. I decided to look for the primary literature for the experiments that the article on TIME.com mentioned. I did a Google search for the first experiment conducted at Purdue University and found a link which lead me to an article published in the journal Appetite entitled “Body Weight Gain in Rats Consuming Sweetened Liquids: Effects of Caffeine and Diet Composition”. This journal article goes into detail about two experiments conducted to see the effects zero calorie sweeteners, such as saccharin, and natural, high calorie sweeteners, such as glucose, have on weight gain. In addition, this article explains the effect saccharin and glucose have on weight gain when caffeine is added; however, the effects of caffeine and the experiments involving caffeine will not be described in this post. The structures of D-glucose, C6H12O6, and saccharin, C7H5NO3S, are shown in the two Jmols below, respectively. In the first experiment, 49 naive, adult male Spague-Dawley rats were split up into four groups according to their body weight. All four groups were given 50g of a flavored, sweetened liquid for 3 hours per day for 14 days. While the liquid was available, the chow was removed and then immediately put back once the 3 hours were up. The chow given to all four groups was the standard, low fat lab diet. Two of the groups received liquid that was sweetened with 10% glucose, while the other two groups received liquid that was sweetened with 0.3% saccharin. The amount of liquid and chow taken in was measured daily. Also, the body weight was measured daily by weighing the rats. The results of this first experiment are summarized in Figure 1. 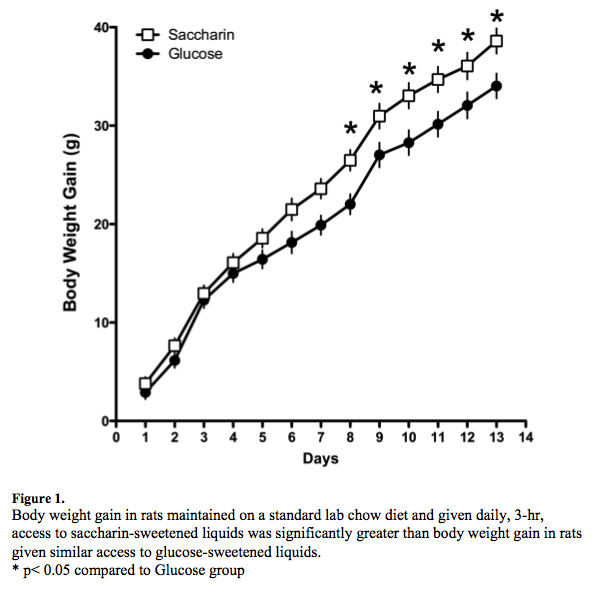 The rats given access to liquid that was sweetened with 0.3% saccharin gained significantly more weight than the rats given access to liquid that was sweetened with 10% glucose. 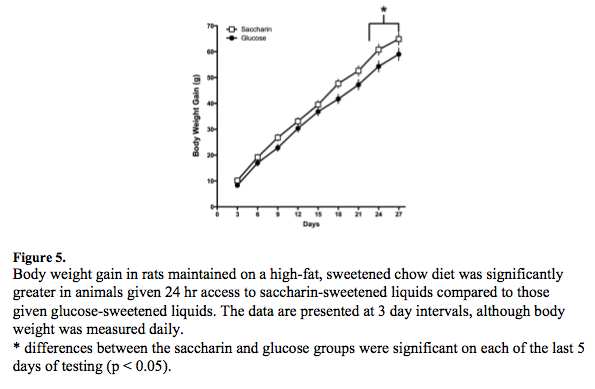 Also, the amount of calories consumed by the rats given access to liquid sweetened with 0.3% saccharin was significantly more than the amount of calories consumed by the rats given access to liquid sweetened by 10% glucose. The increased number of calories consumed by the rats given access to saccharin sweetened liquid accounts for the increased weight gain by these rats. 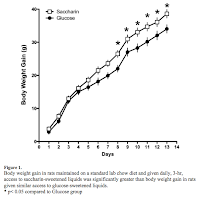 For the second experiment, the effects of saccharin and glucose on weight gain were accessed under dietary conditions similar to a “Westernized” diet high in fat and sugar. Thirty-three naive, male Sprague-Dawley rats were given one week to acclimate to the standard lab chow which was then followed by a week to acclimate to a powdered, unsweetened, high fat diet. After these two weeks, the rats were split into four groups and began to receive access to 30g of sweetened liquid daily for six days a week for four weeks. On the seventh day of each week, each group was given only water and the high fat chow. As with the first experiment, two groups received liquid that was sweetened with 20% glucose, while the other two groups received liquid that was sweetened with 0.3% saccharin. The amount of liquid taken in daily was measured, and body weight was measured daily by weighing the rats; however, unlike the first experiment, the amount of food taken in daily could not be measured because the chow used in this experiment was a powder and was often spilt in the cages that housed the rats. The results of this second experiment are summarized in Figure 2. The rats given access to liquid that was sweetened with 0.3% saccharin gained significantly more weight than the rats given access to liquid that was sweetened with 20% glucose. In addition, the amount of saccharin-sweetened liquid consumed was more than the amount of glucose-sweetened liquid. The increased amount of sweetened liquid consumed by the rats given access to saccharin sweetened liquid accounts for the increased weight gain by these rats. Overall, the results of these two experiments show that consuming liquids that contain a zero calorie sweetener, such as saccharin, causes an increase in weight gain and food intake in rats in comparison to consuming liquids that contain a high calorie sweetener, such as glucose. Therefore, the answer to my first question, “What ingredient in diet soda is ‘bad’ for you?”, is the zero calorie sweeteners used in diet sodas, such as saccharin, and the reason this ingredient is “bad” for you is because it indirectly causes weight gain and increased food intake. After finding the answer to my first question, I decided to dig deeper into my second question, “How does this ingredient cause weight gain?”. I began by doing a Google search for the other study conducted at Purdue University that was mentioned in the TIME.com article. My search brought up a link for an article in The International Journal of Obesity entitled “A Pavlovian approach to the problem of obesity”. The journal article talks about the correlation between the inability to use orosensory cues to predict the amount of calories that are being taken in when eating or drinking and overeating and excess weight gain. Orosensory cues are cues that pertain to taste and another sense. The article contains information about an experiment that was conducted to prove this correlation. The background for the experiment explains that as children, we are subconsciously taught to associate sweetened foods with a higher amount of calories than unsweetened foods. In the experiment, two groups of rats were given access to 50 mL of sweetened solutions flavored with grape or cherry and lab chow. The two groups were classified as Group Consistent and Group Inconsistent. Group Consistent received a solution sweetened with 10% sucrose and a solution sweetened with 10% glucose, whereas, Group Inconsistent received a solution sweetened with 0.3% saccharin and 10% glucose. As seen in the Marvin Sketch above, sucrose, C12H22O11, is composed of glucose and fructose connected by a glycosidic bond and is formed by a dehydration reaction. 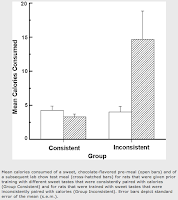 Group Consistent was trained that sweet tastes are consistently paired with a high amount of calories. 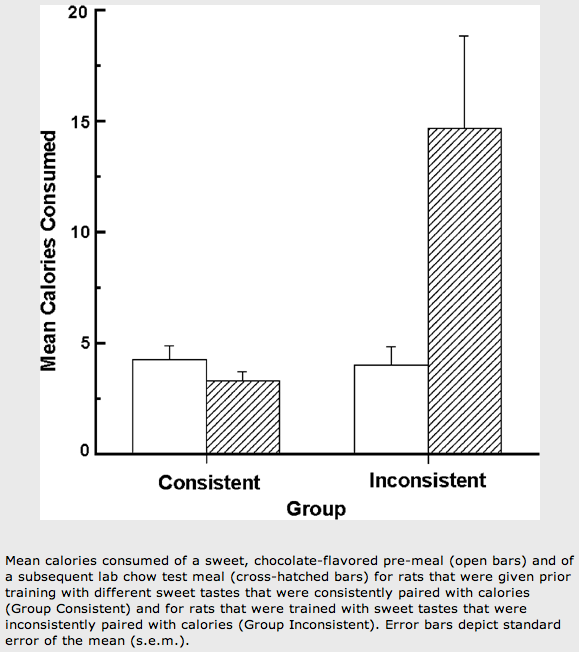 On the other hand, Group Inconsistent was trained that sweet tastes are inconsistently paired with a high amount of calories. After 10 days of these conditions, the rats were given one day with only chow. Following that day, the rats were deprived of food before given access to 4g of a sweet, high calorie, chocolate flavored pre-meal. After being given the pre-meal, the rats were given chow for one hour. The amount pre-meal consumed was the same for Group Consistent and Group Inconsistent. However, as seen in Figure 3, Group Inconsistent consumed a significantly greater amount of chow than Group Consistent. These results show that the rats in Group Consistent were able to anticipate the amount of calories taken in during the pre-meal and compensated for those calories by reducing the amount of chow taken in after the pre-meal. The conclusion of this experiment was that the rats in Group Inconsistent were compelled to consume more calories because of the conditioned association of sweet taste and a lack of calories that are in the zero calorie sweetener. Therefore, the answer to my second question, “How does this ingredient cause weight gain?”, was broadly answered by this journal article; however, it did not give a clear cut mechanism for the cause of weight gain. This figure shows that glucose is the key molecule for beginning metabolism. After having done this research, I began to form my own connection between all the information I learned and my prior knowledge. While reading these articles, I kept thinking back to my biochemistry class and when we were taught the mechanism of metabolism (Figure 4). Metabolism is driven by glucose, the precursor for glycolysis. Although the body has ways to continue glycolysis, the citric acid cycle, and oxidation phosphorylation in the absence of glucose, it runs at its highest efficiency when glucose is present. Therefore, it makes sense that these studies found that rats that consumed zero calorie sweeteners gained more weight due to an increased intake in chow. When you drink a diet soda that contains a zero calorie sweetener, your body is not receiving useful substrates for metabolism. Therefore, your body will tell you that you are still hungry because you did not give it the glucose that it thought it would be getting. This will cause you to intake additional calories and, as a consequence, gain weight. All in all, although my connection between the information I found and my prior knowledge may not be one hundred percent correct, I was able to come full circle from having two questions provoked by my every day life to being able to apply what I learned and what I already knew. Davidson, T. L., and S. E. Swithers. "A Pavlovian Approach to the Problem of Obesity." Nature.com. Nature Publishing Group, 27 Apr. 2004. Web. 15 Feb. 2012. <http://www.nature.com/ijo/journal/v28/n7/full/0802660a.html>. Park, Alice. "Can Sugar Substitutes Make You Fat?" Time. Time, 10 Feb. 2008. Web. 1 Feb. 2012. <http://www.time.com/time/health/article/0%2C8599%2C1711763%2C00.html>. Swithers, Susan E., Ashley A. Martin, Kiely M. Clark, Alycia F. Laboy, and T. L. Davidson. "Body Weight Gain in Rats Consuming Sweetened Liquids: Effects of Caffeine and Diet Composition." MS. Purdue University. National Institute of Health. Web. 2 Feb. 2012. <http://www.ncbi.nlm.nih.gov/pmc/articles/PMC2997566/pdf/nihms245848.pdf>.